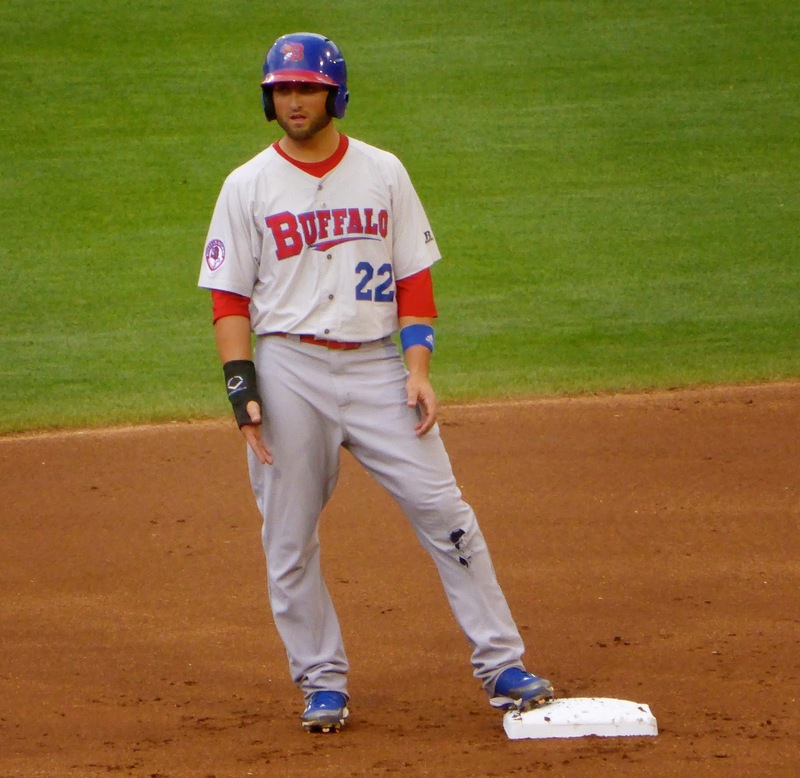 The Buffalo Bisons became Toronto's AAA affiliate in 2013, replacing the Las Vegas 51s who had held the honour for four seasons. This is a dream partnership for both clubs. With the Bisons stadium just 100 miles away from Skydome, player movement is much easier for Toronto, while fans in southwestern Ontario are more likely to visit Buffalo to see the Baby Jays than the Baby Mets. Last year I was still in Singapore and unable to get to any games during the season, so I wanted to make sure I caught a couple this year. Fortunately, the IL's schedule maker sent Buffalo to Columbus for a four-game series right before the Jays were to visit Cincinnati on the weekend. I missed the first two games (won by Columbus) but made it for the last two, although in the end, I only saw one of them. And that took two days. 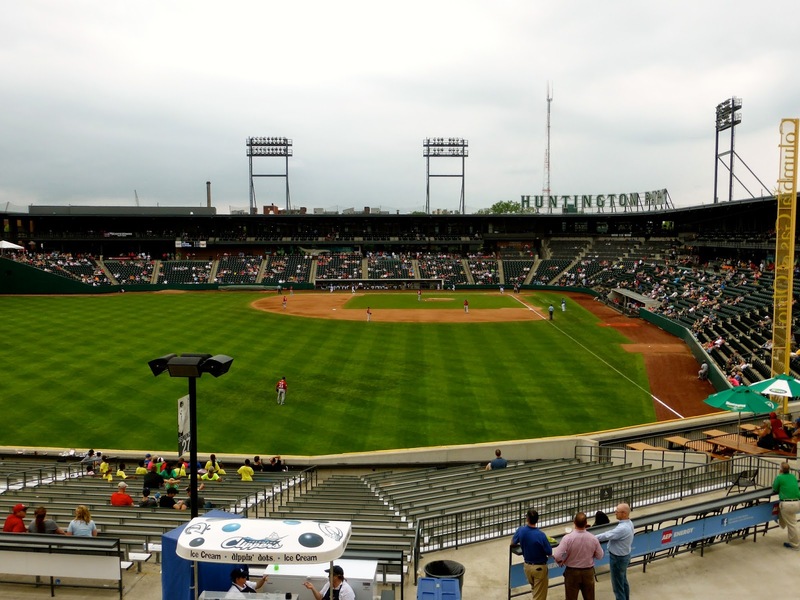 After driving down from Cleveland on Wednesday, I made my way over to Huntington Park, the home of the Clippers since 2009. It has been lauded as one of the best minor league stadiums but I didn't get much chance to check it out, arriving just a few minutes before first pitch, having watched the first half of Croatia vs. Cameroon. I bought a ticket for $15 in the last couple of rows along 3rd base, just under the overhang. Turned out to be a lucky break, as storm clouds soon moved in. 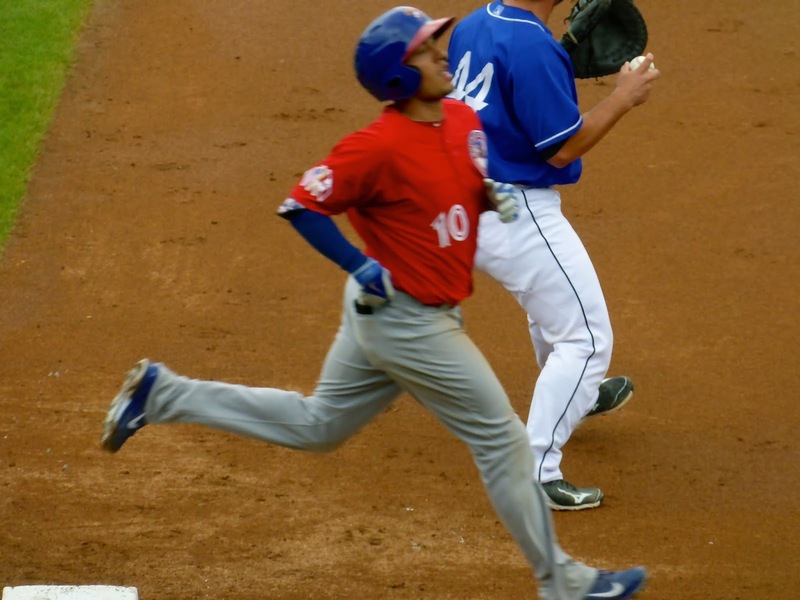 The Bisons started the game with three straight hits, including a double by Kevin Pillar (below), yet no runs. That is because leadoff man Darin Mastroianni was hit by a batted ball off the bat of Adron Chambers. I did not know that was scored a single for the batter, but it is. Sadly, Chambers and Pillar were stranded. 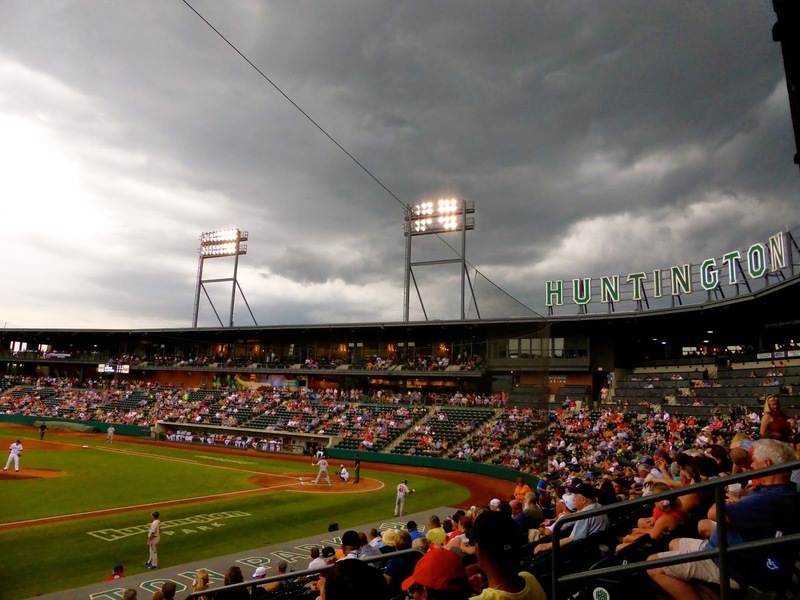 Columbus scored two in their half of the first, but in the second inning, the rain appeared. They tried to play through it, but it eventually became too heavy, causing a short delay. I was lucky to be covered by the overhang while other fans scrambled to drier locations. 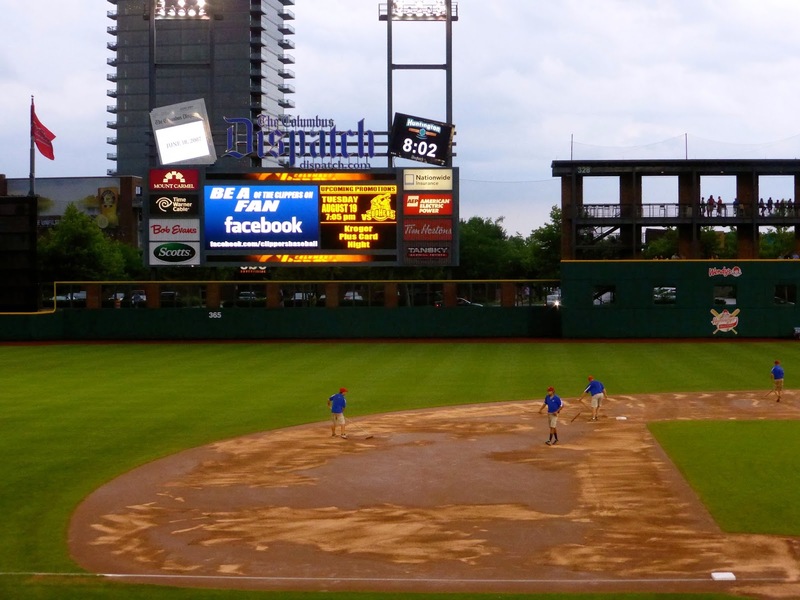 The skies quickly cleared but it took the grounds crew some time to get the infield back in playing shape (below). Turned out to be a waste of time. 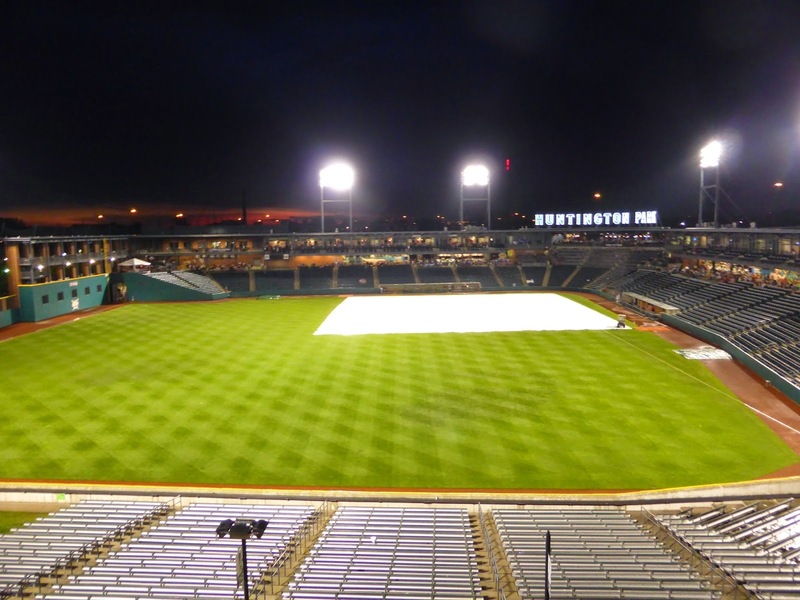 With Columbus up 3-1 in the top of the fourth and the rain starting to fall again, the head of the grounds crew came out and showed the umpire his cell phone. It wasn't pictures of his kids, but the weather forecast, and it didn't look good. The umpire stopped play right then and the tarp was unrolled again, just in time as a torrential rainstorm hit the ballpark a few minutes later. 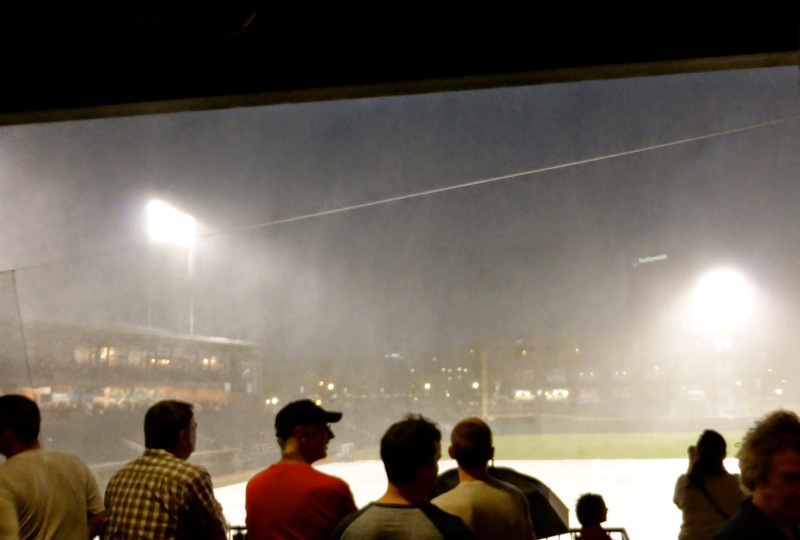 The game was postponed and would be resumed Thursday as part of a doubleheader, but they didn't announce it right away, allowing fans to stay dry and safe with lightning in the area as well. When the call was finally made, the rain had stopped, and as you can see below, the red sunset below boded well for Thursday's afternoon games. The next morning I headed back to the park for the noon start. The weather was humid and cloudy, but no rain was in the forecast. I arrived early and was able to exchange my ticket from the previous evening but amazingly there were no seats left, only standing room. Fortunately, the park has rails along the concourse where you can rest a drink and your scorebook, so I didn't mind this option at all. I took a spot at first base with a nice view of the downtown skyline in the distance. To the left in the photo below is the AEP Power Pavilion, which includes an open air rooftop restaurant with one section of bleachers reminiscent of Wrigley Field. I also had time to check out the entire park and have to agree with the general assessment; it is one of the best I have ever seen. 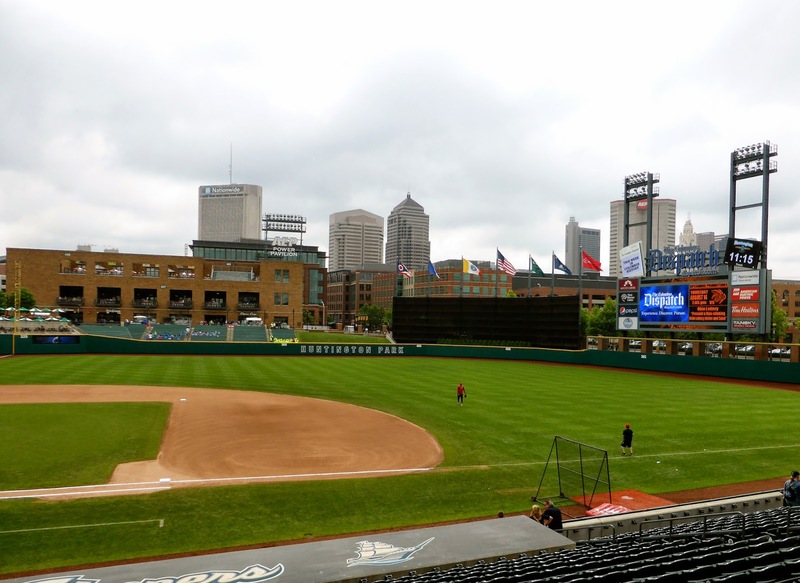 Columbus has a long baseball history, and it is proudly displayed throughout the ballpark. One bit of trivia I was surprised to discover is that the Clippers actually played three seasons in my hometown of Ottawa from 1952-54 before relocating to Columbus as the Jets, where they played until 1970. The franchise returned in 1977 when they were renamed the Clippers and remains there nearly 40 years later. 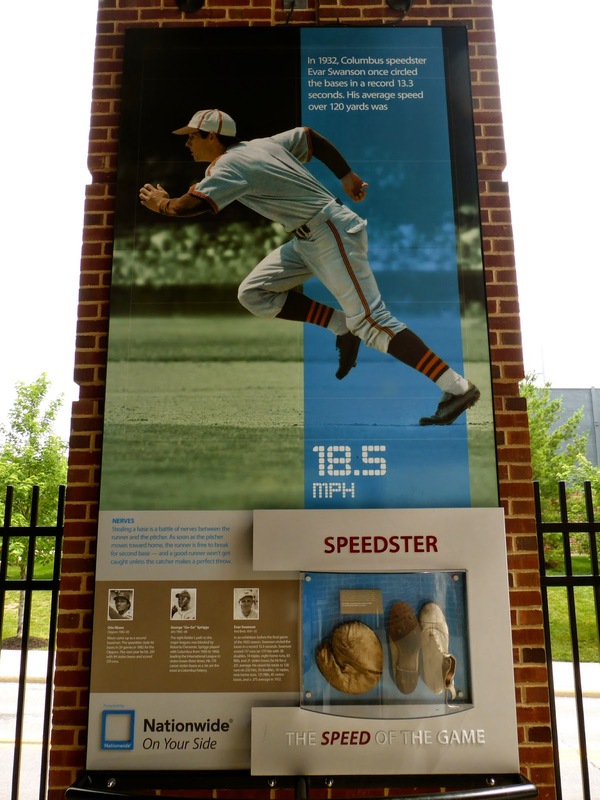 Another interesting display is called The Speed of the Game and although it is clearly sponsored by Nationwide, it does give you some interesting tidbits on how fast the game is actually played. But the most exciting display of all has little to do with baseball. 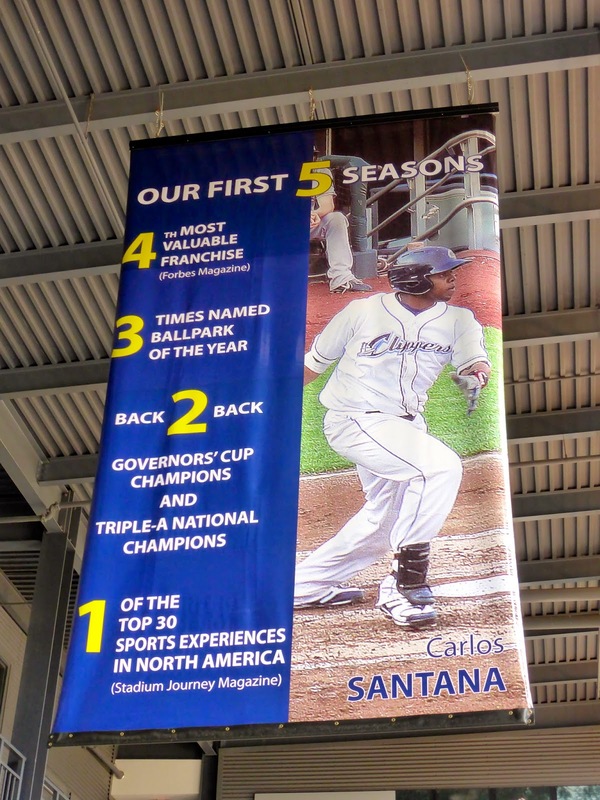 Throughout the concourse, you can see banners like the one below, which extol the ballpark and team's success since it opened. Look at #1 below - they quote Stadium Journey magazine, which ranked them #29 in North America this year. When I told other fans that I worked for Stadium Journey, they actually knew what I was talking about! I found this display to be very gratifying given how much effort has been put into the entire Stadium Journey project. Rather than go through all the amenities here, I'll encourage you to read the review on Stadium Journey. Anyway, there was a game to complete. It resumed with two new pitchers, but the same lineups otherwise. Buffalo had men on first and third with two out but Ryan Goins struck out on three pitches to end that threat. 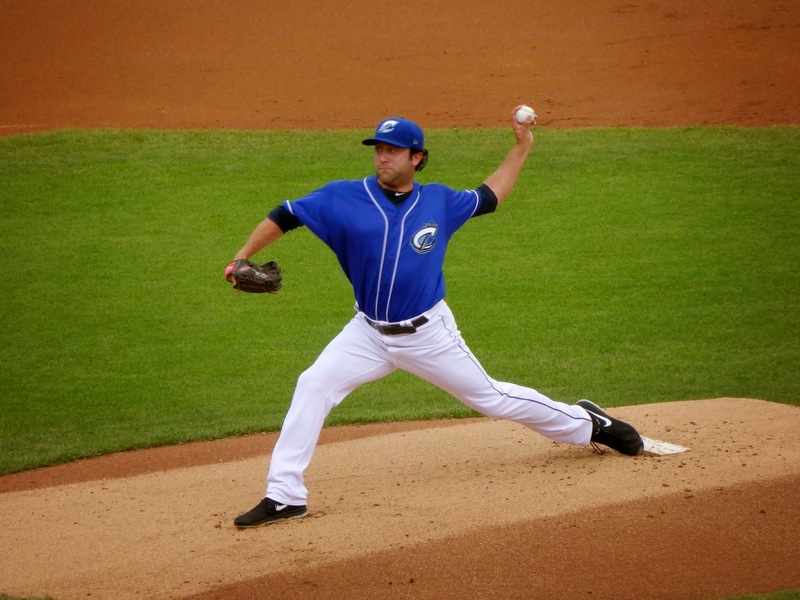 Kyle Drabek (below) took over for Buffalo and was pretty good, tossing five scoreless innings and giving up just one hit. Jared Goedert, a former Clipper, hit a 3-run homer in the sixth and Mastroianni added a solo shot in the 8th and the Bisons completed the comeback with a 5-3 win. Yay! After a 30-minute break, the teams came out to play a seven-inning game. 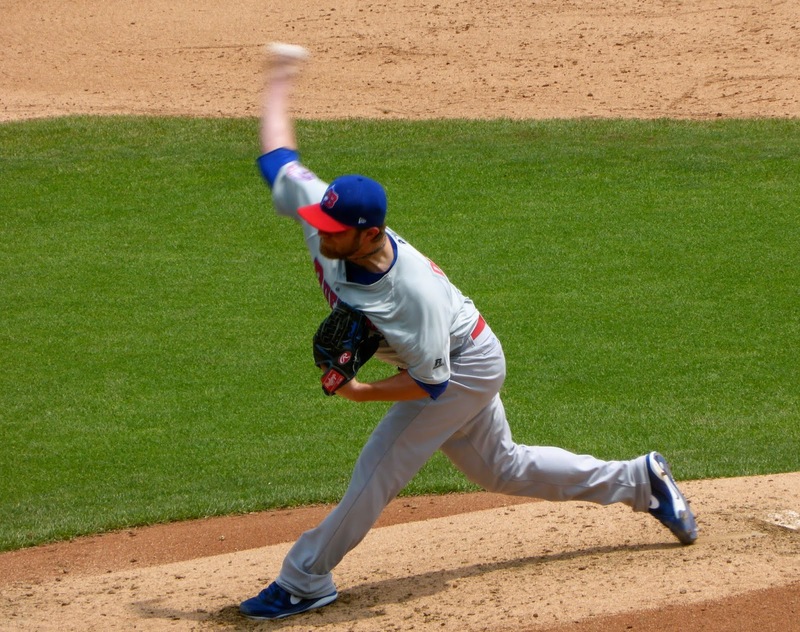 Top prospect Aaron Sanchez was supposed to start for Buffalo but he was pushed to Friday and career minor leaguer Austin Bibens-Dirkx took the bump for the Bisons, with T.J. House (below) doing the same for Columbus. House started five games for the Indians earlier this season, but had been sent down for more seasoning. Buffalo was quickly set down in the first, including Goins grounding out (below). I do like how the teams change uniforms for the second game of the doubleheader, it makes it easier to remember which pictures are from which game. In the bottom of the inning, Carlos Moncrief hit a 3-run homer to give the Clippers a 4-0 lead. At this point, I decided to make my way to the Hall of Fame Bar, on the second floor of the Power Pavilion. The place was packed with several groups enjoying a half-day off work and most ignoring the game. The bar has a few TVs and although most were tuned to the game broadcast, there were a few showing the World Cup match between England and Uruguay, which I (stupidly) wanted to watch. So I kept one eye on the telly and one eye on the scoreboard and while England suffered defeat at the feet and head of Luis Suarez, Buffalo marched back with 3 in the second, 2 in the third, and singletons in the fourth and sixth to take a 7-4 win. I stepped out on occasion to watch a few pitches, but from this far away, it is tough to stay focused on the game. So in the end, I saw one game over two days, and the Bisons managed a split of their four-game set. Now onto Cincinnati to see if the Jays can get back to winning ways themselves. Attendance for Wednesday's game was 8,888. In Cleveland, I mentioned there was a dog performance during one of the inning breaks. Turns out that it is Jake the Diamond Dog (above) who usually performs at minor league games and was in Columbus today. 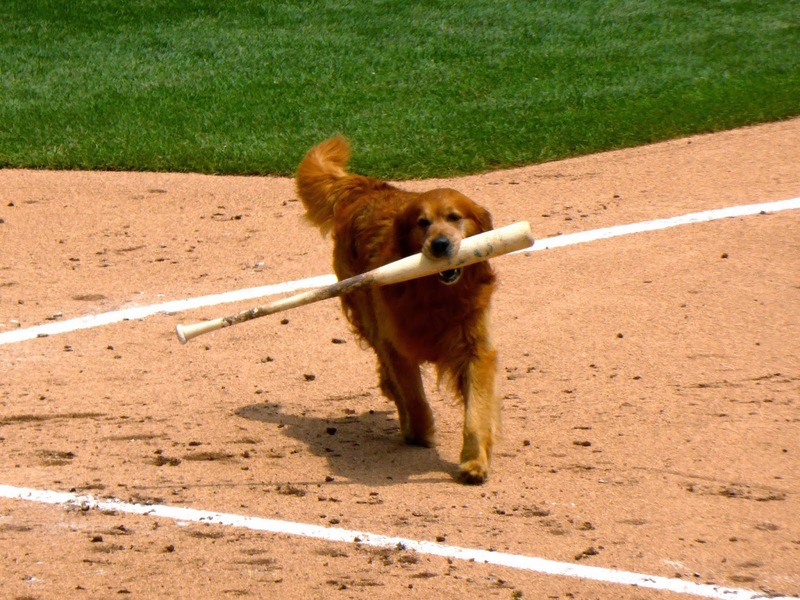 He is most famous for being the bat dog for an inning or two but can be spotted delivering flowers or catching frisbees.